R/C Aerochopper (RCAC) by Ambrosia Microcomputer Products, is a radio-controlled flight simulator for the Atari ST that includes 32 preprogrammed scenarios. David Stern, the genius behind this program, spent over three years in its development, and it shows. I have spent literally hundreds of hours using this program and haven't found a bug. RCAC, a cartridge-based program, is manufactured and packaged for Ambrosia by Futaba Corp., perhaps the world's largest supplier of radio-control units. The system comes complete with a Futaba Conquest series transmitter box, connecting cables, program ROM cartridge and 90-page manual. The transmitter is an actual R/C transmitter minus the internal electronics for transmitting radio waves. It has two spring-loaded control sticks, which move like joysticks but with much finer control. Two push-button switches, the function of which varies with the scenario selected, are mounted one above each stick. The connecting cable plugs into the ROM cartridge, and the cartridge plugs into the cartridge port. I could not find a program that was affected by the presence of the cartridge; therefore, it could conceivably be left installed, though the manufacturer doesn't advise it. The right control stick works the ailerons and elevator. When the stick is moved left or right the on-screen plane rolls (dips a wing) in that direction, and the plane turns. 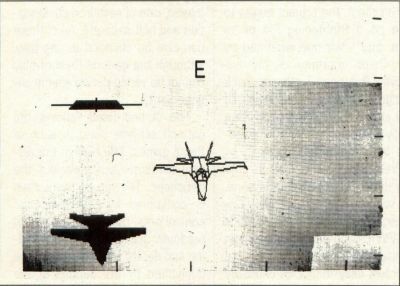 When the stick is moved forward, the nose of the plane goes down, causing it to dive. If the stick is pulled back, the nose of the plane goes up. The left control stick controls the rudder and the throttle. When the stick is moved left or right, the nose of the plane turns in the direction the stick was moved. When the left stick is moved forward the throttle advances and the speed of the plane increases. In the start-up scenario (Scenario 5), the left push button drops bombs and the right push button launches missiles. There are two targets provided on the background. The bomb target is a red square just off the eastern coordinate, while the missile target is a blue and yellow billboard off the western quadrant. R/C Aerochopper is one of the most complex and enjoyable programs I have had the pleasure of owning. If you want to learn to fly radio-controlled aircraft without weather worries or the expense of crashing, this is the program for you. 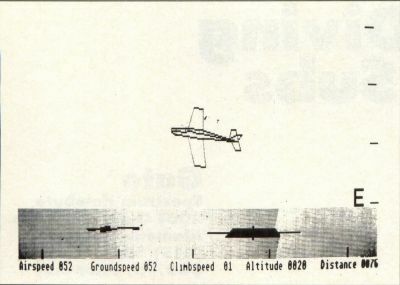 The program uses 3-D line drawings (a la Starglider) to represent aircraft. The animation is lightning quick. Since the program resides in ROM, there is no jerky movement like those found in Flight Simulator II. The frame rate varies between 15 and 30 frames per second depending on the complexity of the frame drawn. The result is very fluid motion. To do some flying you have to select either Fly Airplane or Fly Helicopter from the main menu. If you select airplanes, you have four types to choose from: a high-wing trainer, a low-wing (aerobatic or Pattern) plane, a F-15-type jet and a glider. If you select helicopters, you have a choice of a Bell Jet Ranger, a Hughes 500 or a pod-and-boom-type chopper. The program comes set up with the low-wing airplane as the default airplane and the Jet Ranger as default for helicopter. RCAC has many special features. By selecting various menus you can change the responses of your aircraft or the conditions under which they fly. The wind menu, for example, lets you change the intensity of the wind. Wind can be varied from no wind at all to hurricane force. You can also control thermals (hot, rising air) for glider flight, and many other features, such as wind direction, gust frequency and speed changes. There are two combat modes included. The first mode lets you try to shot down target drones in a five-minute timed run. The other mode is a two-player mode in which two ST systems with RCAC installed can be connected through the MIDI ports. With this mode you can race, fly formation or shoot it out. All in all, there are over 143 parameters you can change. This really lets you customize the performance to suit your preference. In all fairness, I must tell you there is one area where R/C Aerochopper falls down. The manual, while complete and covering all aspects of the program, is full of typographical errors. I was assured, however, that future copies of the program manual will have the errors corrected. R/C Aerochopper is one of the most complex and enjoyable programs I have had the pleasure of owning. If you want to learn to fly radio-controlled aircraft without weather worries or the expense of crashing, this is the program for you. The feel is so similar to actual flight, I could even recommend RCAC as a training aid. 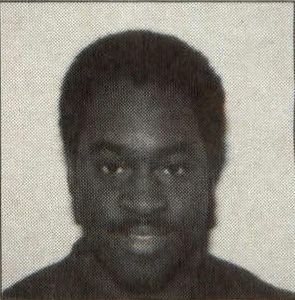 Bill Griggs is a computer addict who moonlights as a New York state trooper. He has hosted several conferences on radio-controlled aircraft on the Hobby-shop SIG of DELPHI.